For months now, thoughts about my homeland have been crossing my mind. The events that take over the daily headlines have me contemplating America in what she used to be and what she has become. With these thoughts, mixed feelings are felt and levels of hope and despair fluctuate. On Sunday, I watched a lot of football. Three times I stood in my living room as dozens of individuals stretched out a flag covering the entire square footage of the playing field. Three times I listened through a moment of silence for the 15th anniversary of the September 11th terrorist attacks followed by a performance of our national anthem. Three times I got choked up. Only two times I felt embarrassed. When the feelings of silliness began to rise during the third occasion, they were sent packing with one simple thought: it’s okay to love my country. I’ve noticed a tendency toward extremes in people’s statements on America lately. So much of it goes all the way back to our collective reaction to September 11th. That attack felt intensely personal even to those of us who did not know individuals lost that day. I remember the sensation of protectiveness, of “how dare you hurt what is mine!” A new era of patriotism was ushered in, justifiably and beneficially so at the time. The experience awakened in many of our hearts a hibernating bear of attachment to our country. As is perhaps bound to happen though, the fierce plunge into patriotism was taken to an extreme by some. A refusal to hear a word against America and its culture; a disdain for most other nations and nationalities; a fear of anything that appeared outside the realm of what we now held so dear about our homeland. Then the last 10 years or so saw a whiplash reaction; a violent swing to the other end of the spectrum where a high regard for our nation is ridiculed as blind and foolish. The extremes frustrate me. I see patriotism as a genuine love of home and country. Genuine love is unconditional but it is not naive. Maybe the extremes are rooted in a misunderstanding of unconditional love. To love someone unconditionally is to love them through anything and everything. Highs and lows, achievements and mistakes, rights and wrongs; love them through it all. Unconditional love is not dependent on the other person earning the love. It is dependent on the giver of love choosing to offer it no matter what. However – and this is an important ‘however’ – unconditional love is not a refusal to recognize flaws. It is not turning a blind eye to what needs to change in the beloved. It is loving them despite the existence of those flaws and seeking productive ways to help them make changes in their best interest. The extremes aren’t authentic love. One is claiming that because you love your country, anyone who has anything to say against her be damned. The other is a refusal to love her so blindly but then just as blindly treating her as wholly unlovable. Neither are true patriotism. 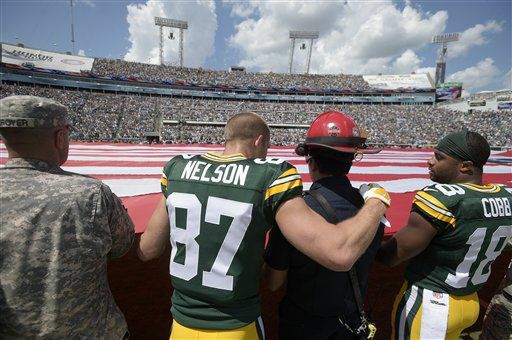 It’s okay to be moved by the sight of soldiers, firemen, policemen, and athletes all holding a football field sized flag. It’s also okay to look at the political system with a critical eye. It’s okay to oppose a federal law that contradicts what you know to be morally good. It’s also okay to teach your children to be proud to be American. It’s okay to love your country.